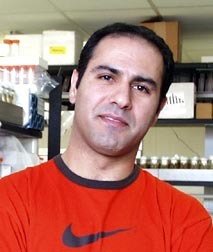 Walid Fakhouri is a Postdoctoral Research Associate in Microbiology and Molecular Genetics at Michigan State University who has so far worked on two IdeaConnection R&D challenges. Here he talks about his experience as a solver, his success rate and what first attracted him to become part of a problem solving team. As scientists, we like to be challenged by something new or by a hypothesis, question, or a request. And the fascinating thing for me is that at IdeaConnection you are competing with people you don't know and you try to get the best out of yourself, and out of your experience, and out of your knowledge and intelligence. Do you find that you personally have been stretched, have been challenged intellectually when working on these problems? Absolutely, absolutely. So far I have worked on two challenges. One of them was not directly related to my current research area and I had to really use a lot of my background knowledge and to read a lot, and think about it for a while. How have you found this experience of working in a virtual team, with people you haven't met before? I think it's phenomenal. First of all, you have no preparation. All of a sudden you meet with people from all over the world, from different backgrounds and experiences, and you just have science as the common language. I see how everybody looks at the challenge from a different point of view or a different angle to address the request in the best way they believe will solve our goal, our purpose. Has having a diverse spread of disciplines on the teams helped to generate deeper solutions, more arguments and debates? All of the above. We sometimes have to go through a lot of argument, a lot of debate. I remember I was in agreement with another solver but the other two were not in full agreement, and everyone had to make their case as best as they could in order to convince the rest of the team. I think that was really challenging. But I believe the amazing thing is that we learned a lot. When you put yourself in such an environment, it's very challenging. The other people are also smart, and maybe even smarter than you, so it’s not easy. I think you try to come up with the best solution and you try to come up with the best out of yourself. What’s your success rate with the challenges you've worked on so far? Fifty percent. With one the solution, it's not like it wasn’t accepted, the seeker felt we didn't really work hard on addressing the controls. The second challenge was very close to my research area, and I knew from the beginning as I read the challenge that we would do well. And we did. We were the successful team. It was nice to have an award and money for the time that I spent. But the emotion was more interesting of competing with other people and then being the successful team. That gives you a lot of confidence, a lot of motivation and this truly was much more important to me than the monetary reward. Especially as this was my area of expertise, so I should be doing well. What’s your view of working on a contingency basis; that you only get paid if you deliver a result that a seeker wants? I think it's fascinating, because first of all, if you are not rewarded and you're not paid, you have still learned a lot from the challenge that you worked on. For us, we pay money to sit in classes to learn, and here you learn from your mistakes and you learn from your successes. And at the end, if you're the successful team you even get a big bonus, a good reward. How have facilitators helped the problem solving process? I think they are vital for the whole process, because we have to work on the solution and to also coordinate within the team members and with the people at IdeaConnection. Overall, how would you sum up your experience with IdeaConnection so far? It's a fascinating experience and I'm looking forward to the next challenge. I think it's a way to give me more confidence about my scientific knowledge, and to challenge even my knowledge with other peers.